Gazprom Neft says it has completed the development of a logistic scheme for shipment and transportation of crude oil from the Novoportovskoye field. The final phase of the project implementation which took four years was the standby positioning of the Andrey Vilkitsky icebreaker and the launching of the world’s first ever digital Arctic-logistics management system, the ‘Kapitan’ system. The key element of the transportation system is the Arctic Gate terminal in the water area of the Gulf of Ob. It is the world’s only oil terminal operating in fresh waters and in challenging ice conditions. Put into operation in 2016, the territory ensured year-round shipments of Novy Port crude from the Novoportovskoye field. Specific conditions in the Gulf of Ob called forth the development of the fleet of tankers and icebreakers able to operate in shallow waters. A series of six Arc7 class tankers has been built to the order of Gazprom Neft to deliver crude oil to a storage tanker placed in the Kola Bay. The Shturman-series tankers are able to break through ice of up to 2.5 meters thick. Besides, two diesel-electric icebreakers of the new generation, the Aleksandr Sannikov and the Andrey Vilkitsky, are available on twenty-four-hour duty in the Gulf of Ob. Investments in the Novoportovskoye field development have exceeded RUB 300 billion. 11 infrastructure facilities have been put into operation from the beginning of the project implementation with crude oil output having exceeded 15 million tonnes. 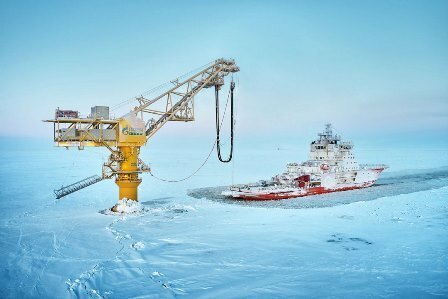 The Novoportovskoye field is one of the most significant oil and gas condensate fields currently under development in the Yamalo-Nenets Autonomous Okrug. Recoverable C1 and C2 reserves are estimated at more than 250 million tonnes of crude and condensate, as well as more than 320 billion cubic metres of gas (including Palaeozoic deposits). The field is located in the south—east of the Yamal Peninsula, some 250 kilometres north of Nadym, and 30 kilometres from the coast of the Gulf of Ob. In 2018, Gazprom Neft subsidiary Gazpromneft-Yamal produced and transported by the Northern Sea Route 7.1 million tonnes of Novy Port crude oil. This innovative project named “Kapitan (Captain)” has been developed to ensure uninterrupted year-round shipments of all ARCO and Novy Port crude produced, and to improve efficiency in logistics management. This analytical system makes use of various information sources, including daily production volumes at Gazprom Neft’s Novoportovskoye and Prirazlomnoye fields, total cumulative oil stocks, the position and movement of vessels, data on en-route ice conditions, tidal graphs, weather conditions, and scope for developing new market standards in crude supplies (“delivery lots”). Implementing the system has facilitated significant time savings in planning and coordinating oil shipment operations and optimising transportation costs.